Penn Jersey is a proud Ceiling Pro practitioner, in addition to our other range of business cleaning services. We offer ceiling cleaning services to Gymnasiums as well as other public spaces used for keep fit and exercise. Whether your premises are large or small, our Gymnasium Ceiling Cleaning services ensure your commitment to providing safe and clean spaces to your clientele go far beyond the ground they walk on and the equipment they use. A clean gymnasium is a safe one, and this is true for any undercover space in which members of the public may congregate to exercise. A properly cleaned and hygienic space for customers to use on a daily basis will likely bring more in the way of returning clientele and will also provide paying customers with a healthy environment in which to work out. Penn Jersey are a proud Ceiling Pro practitioner and deliver an exceptionally high standard of Gymnasium Ceiling Cleaning service. Whatever type of ceiling you have in your gymnasium, our cleaning service will negate the need for tile replacement, or painting. Our unique and specialized cleaning service will help ensure safe and clean surfaces and Penn Jersey pay particular attention to acoustical and textured ceiling and ceiling tiles. Exceptional value: Professional gymnasium ceiling cleaning is much more affordable then painting tiles or replacing them. It’s cost effective and healthier in the long term. Keep fire resistance: In public spaces like gymnasiums, fire safety should be of paramount importance. Painting over ceiling tiles can increase the likelihood of fire and fire damage. Our safe cleaning process will not affect this. Lighter, brighter environment: Keep your premises light and airy with our pro gymnasium ceiling cleaning service. It helps save energy and will take away any need for extra lighting to be installed or decorating work to be undertaken. Hygienic, safe and clean: Your ceiling will be much more hygienic, safe and clean. This is better for your business all-round, as well as your customer base. Professional stain removal: Whatever is marking or discoloring your ceiling, whether it’s water damage, smoke, grease or anything else, our process will remove it and return it to like-new quality. School gyms and locker rooms are the perfect environment for germs and bacteria to grow, which is why cleaning is essential. The nature of bacteria means it can spread and be found anywhere, meaning every element of every space should be fully cleaned and disinfected. School and college gymnasiums have such a high footfall that germs can spread extremely quickly and reach every aspect of the space. This once again highlights the importance of professional and intensive gymnasium ceiling cleaning for your premises. The very nature of activities in the gym mean the environment is perfect for the growth of bacteria. Once growth begins they rapidly multiply and can become a serious health hazard. While not all grime and dirt is indicative of bacterial growth, a clean environment is much less likely to encourage the growth of germs and bacteria. The school gym is a space for health and fitness, so ensuring it is hygienic and clean should be a number one priority. With Penn Jersey gymnasium ceiling cleaning you can be sure of a fully cleaned and hygienic environment for all your sports and gym classes. Our expert teams work swiftly to deliver quality cleaning services, brightening your gymnasium and removing any signs of dirt and grime for a cleaner environment. We work efficiently at a time to suit you, outside of school hours or even in the holidays to ensure the gym is ready for when the students return in the fall. 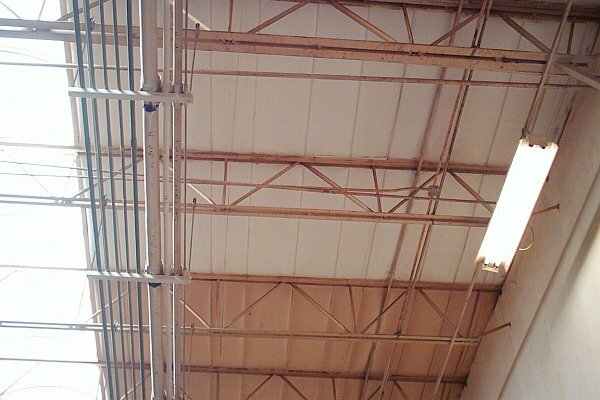 As a company, Penn Jersey have worked on ceilings in very unsanitary conditions and returned them to new-like quality. Our employees are highly trained and experienced and will carry out the work on your premises to a high, professional standard. Further to this there will be no mess, or disruption to your business as we carry out our work.